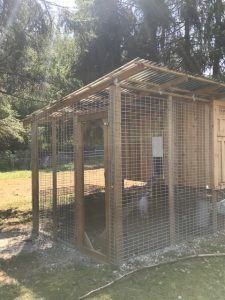 Ah CHICKEN COOPS, a DIY project that can cost very little each time, time and time again(which eventually adds up), or costing a lot in one singe blow, but your only doing it once. A wise individual once told me – “Spend the time to think it thru, and do it right the first time” and I actually do hear that crackly accent of Yodas voice, when that line is floating in my head, when thinking about building something permanent. 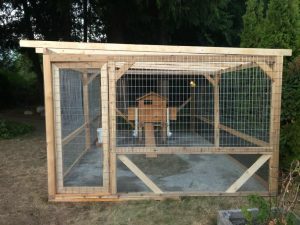 For me the main concern when building a chicken coop, is keeping our chickens alive, keep the rat population down and the bears/coyotes/owls out. We sell our eggs, so each chicken is literally a “$”. If your food is contained and rationed, it will help reduce the lure of rats. 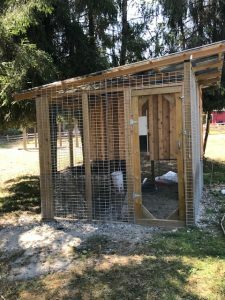 A Chicken Door will help you keep the rats out of nesting/roosting huts at night or it can close a door behind them after a day of free-ranging. In the application you require, being on a timer for a specific time for opening or closing (Standard Version) or having it timed with Dawn or Dusk (Premium Version), greatly help these situations. 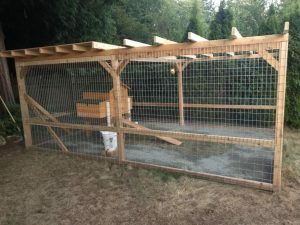 As for Coop construction, I’m not going to go into detail about roost, nesting boxes, the wood application part, I like to discuss the mesh/fencing element. I like to hardware cloth the whole bottom of the coop and about 2 feet up the walls, so there there is no digging from under, or digging down when they are caught inside by chance. The walls of the outside coop, I recommend Welded Mesh panels, a bear or coyote will not be able to rip those down. Welded Mesh Panels of 8ft or 16ft panels, 2×4 hole pattern, you can literally build a wooden frame and mount a single panel, and done.